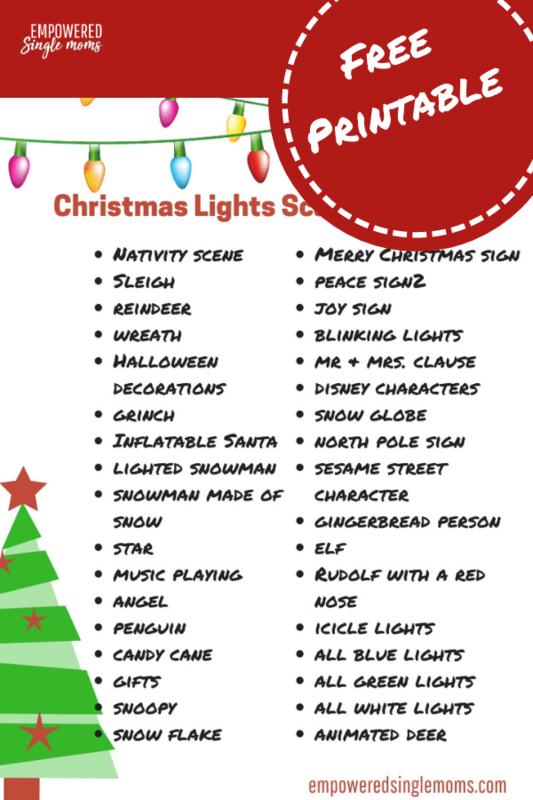 Inside: Ideas for a Christmas scavenger hunt with free printable. There are so many variations on the Christmas scavenger hunt your kids’ faces will light up when you suggest it. 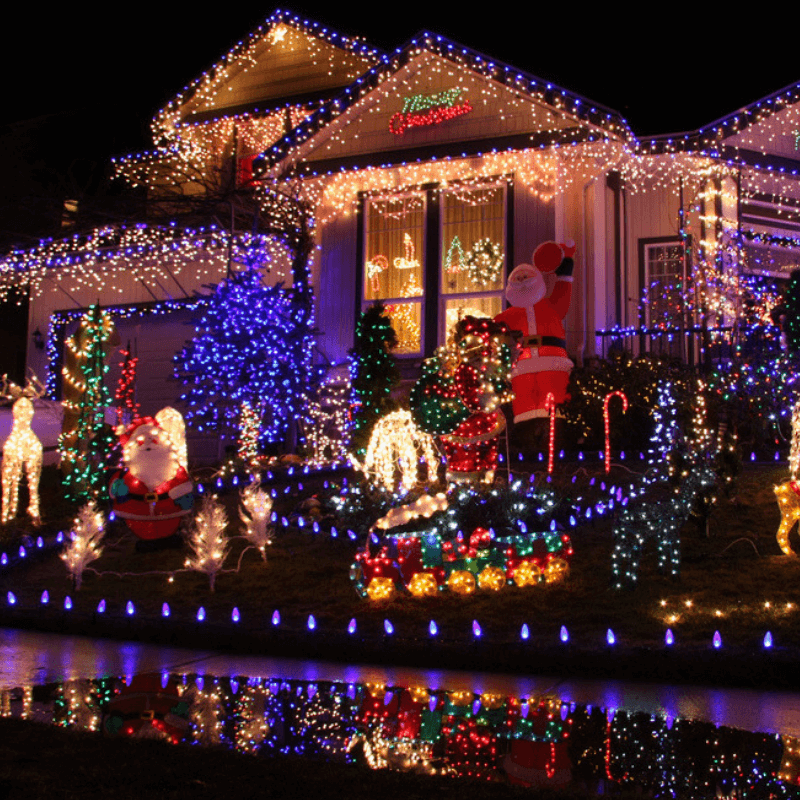 I had a lot of fun writing Family Christmas Traditions to start for $5 or Less. My sons were home and they helped me brainstorm ideas. One of their friends stopped by and he was proud to add an idea to the list. When I shared the ideas with friends one of them gave me a new idea that I added to the list. She said her family likes to print off a scavenger hunt sheet to take along when they go look at the lights. That sounded like fun so my boys and I brainstormed ideas to make a scavenger hunt list for you. There are many fun ways to use this list. You can use one list as a family. Each person could take their own list and silently fill it out in the car. If you invite other families over during the holidays you could go out in teams with a time limit of an hour and see which team gets the most points. If you live in a neighborhood you could use the list when you go out for a walk either as a family or in teams when you have friends over. You could get a lot of points at this house. There is also the question of rules. If you send teams out in cars an important rule is to follow all traffic laws, no speeding allowed and teams must park legally if they are getting out to take pictures. Another important rule is whether you can earn only one point per house or can one house provide multiple points? It doesn’t really matter which way you do it, except that everyone needs to follow the same rule. If you have a group with mixed ages and you are not in teams will everyone follow the same rules or will you give the younger ones an advantage by letting them collect more than one point at a house? You could take each team or family member at their word, but if you go out in teams providing proof of each of your finds would be part of the fun. There are at least a couple of options to provide proof. Teams could write down the address where they saw each thing on the Christmas scavenger hunt list. They could take a picture of a team member next to each item with their cell phone. If you make it a competition it is fun to have prizes. You could have Christmas crowns for the winners or give the winners packets of hot chocolate mix. Now that we have the list I am looking forward to playing this with my own family this Christmas. 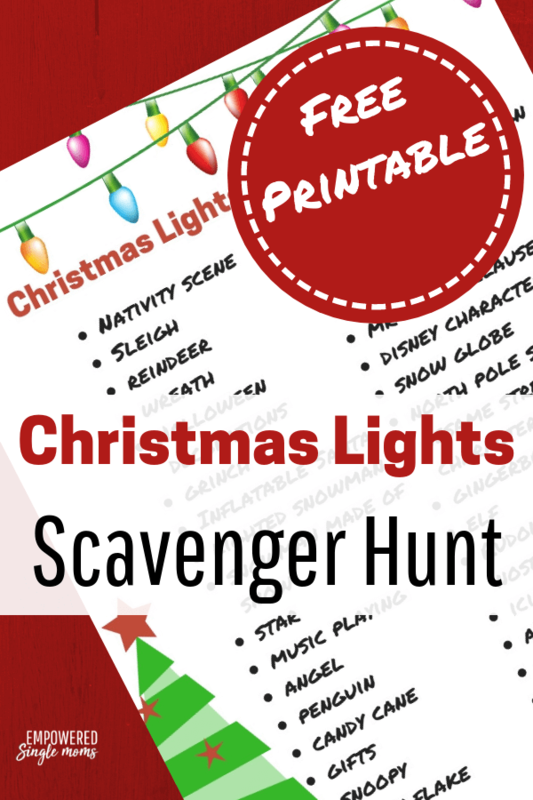 The free Christmas Scavenger Hunt Printable is in my members only resource library. Sign up for my newsletter and get access to the resource library as a thank you for joining. Do You Know How to Have a Fun & Cheap Single Parent Holidays? She uses pictures in this one, so it is great if your little people can’t read yet.